Researchers identify the amino acid aspartate as a metabolic limitation in certain cancers. Remove tumor cells from a living organism and place them in a dish, and they will multiply even faster than before. The mystery of why this is has long stumped cancer researchers, though many have simply focused on the mutations and chains of molecular reactions that could prompt such a disparity. Now, a group of MIT researchers suggests that the growth limitations in live organisms may stem from a different source: the cell’s environment. More specifically, they found that the amino acid aspartate serves as a key nutrient needed for the “proliferation” or rapid duplication of cancer cells when oxygen is not freely available. The biologists took cancer cells from various tissue types and engineered them to convert another, more abundant substrate into aspartate using the gene encoding an enzyme from guinea pigs. This had no effect on the cells sitting in a dish, but the same cells implanted into mice engendered tumors that grew faster than ever before. The researchers had increased the cells’ aspartate supply, and in doing so successfully sped up proliferation in a living entity. Lucas Sullivan, a postdoc in Vander Heiden’s lab, is the lead author of the study, which appeared in Nature Cell Biology on June 25. Isolating a single factor that could impact tumor growth within an organism is tricky business. One potential candidate came to Sullivan via a paper he co-authored with graduate student Dan Gui in 2015, which asked a somewhat controversial question: Why is it that cells need to consume oxygen through cellular respiration in order to proliferate? It’s a rather counter-intuitive question, because some scientific literature suggests just the opposite: Cancer cells in an organism (“in vivo”) do not enjoy the same access to oxygen as they would in a dish, and therefore don’t depend on oxygen to produce enough energy to divide. Instead, they switch to a different process, fermentation, that doesn’t require oxygen. But Sullivan and Gui noted that cancer cells do rely on oxygen for another reason: to produce aspartate as a byproduct. Aspartate, they soon confirmed, does, in fact, play a crucial role in controlling the rate of cancer cell proliferation. In another study one year later, Sullivan and Gui noted that the antidiabetic drug metformin, known to inhibit mitochondria, slowed tumor growth and decreased aspartate levels in cells in vivo. 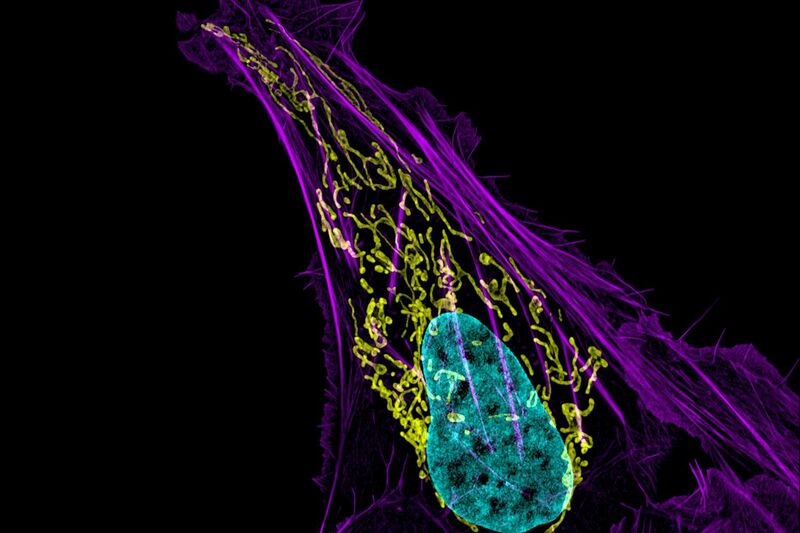 Since mitochondria are key to cellular respiration, Sullivan reasoned that blocking their function in an already oxygen-constrained environment (the tumor) might make cancer cells vulnerable to further suppression of respiration — and aspartate — explaining why metformin seems to have such a strong effect on tumor growth. Despite being potentially required for certain amino acids and the synthesis of all four DNA nucleotides, aspartate is already hard to come by, even in oxygen-rich environments. It’s among the lowest concentration amino acids in our blood, and has no way to enter our cells unless a rare protein transporter is present. Precisely why aspartate import is so inefficient remains an evolutionary mystery; one possibility is that its scarcity serves as a “failsafe,” preventing cells from multiplying until they have all the resources to properly do so. Regardless, the easiest way for cells to get aspartate is not to import it from outside, but rather to make it directly inside, breaking down another amino acid called asparagine to generate it. However, there are very few known mammals that have an enzyme capable of producing aspartate from asparagine — among them, the guinea pig. In the 1950s, a researcher named John Kidd made an accidental discovery. He injected cancer-ridden rats with sera from various animals — rabbits, horses, guinea pigs, and the like — and discovered that guinea pig serum alone shrunk the rats’ tumors. It wasn’t until years later that scientists learned it was an enzyme in the guinea pig blood called guinea pig asparaginase 1 (gpASNase1) that was responsible for this antitumorigenic effect. Today, we know about a host of simpler organisms with similar enzymes, including bacteria and zebrafish. In fact, bacterial asparaginase is approved as a medicine to treat acute lymphocytic leukemia. Because guinea pigs are mammals and thus have similar metabolisms to our own, the MIT researchers decided to use gpASNase1 to increase aspartate levels in tumors in four different tumor types and ask whether the tumors would grow faster. This was the case for three of the four types: The colon cancer cells, osteosarcoma cells, and mouse pancreatic cancer cells divided more rapidly than before, but the human pancreatic cancer cells continued to proliferate at their normal pace. When the researchers tried to slow tumor growth using the antidiabetic metformin, the cells expressing gpASNase1 remained unaffected — confirming Sullivan’s prior suspicion that metformin slows tumor growth specifically by impeding cellular respiration and suppressing aspartate production. Although the efficacy of using metformin to treat cancer remains controversial, these findings indicate that one means to target tumors would be to prevent them from accessing or producing nutrients like aspartate to make new cells. Birsoy is a former postdoc in professor of biology David Sabatini’s lab, who authored a paper published in the same issue of Nature Cell Biology, identifying aspartate as a major growth limitation in oxygen-deprived tumors. The research was funded by an NIH Pathway to Independence Award, the American Cancer Society, Ludwig Center for Molecular Oncology Fund, the National Science Foundation, a National Institutes of Health Ruth Kirschstein Fellowship, Alex’s Lemonade Stand Undergraduate Research Fellowship, Damon Runyon Cancer Research Foundation, Howard Hughes Medical Institute Faculty Scholar Award, Stand Up to Cancer, Lustgarten Foundation, Ludwig Center at MIT, the National Institutes of Health, and the Koch Institute’s Center for Precision Cancer Medicine.